Sensei has teamed up with Black Shark to gift two of their fans with amazing brand new gaming smartphones! 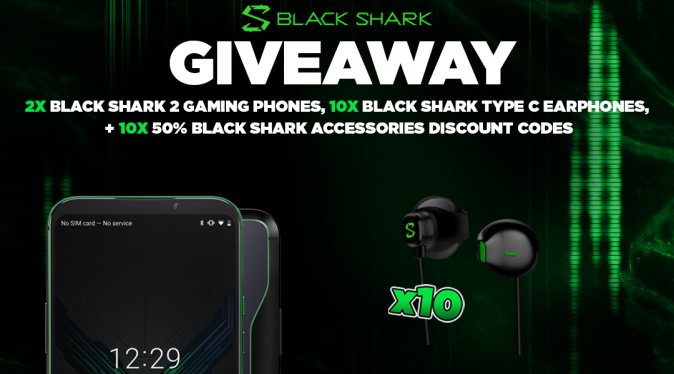 To enter in their latest Black Shark 2 Gaming Phone and Type C Earphones Giveaway grab your free entries by following few simple steps listed down below! On the back, Black Shark 2 is covered in glass with metal. The texture is nice even though the rear panel is not flat. If you have ever held the Black Shark Helo, then know that the texture is the same on the new Black Shark 2. There are two cameras on the left top corner, which host the 48MP+13MP setup, and a flashlight vertically set below the module. I need to add that, compared to Xiaomi Mi 9, the rear camera module of Black Shark 2 protrudes a bit too much. Black Shark 2 features two RGB light strips on the phone’s two sides gleaming when the phone is charging, receiving a message or winning a game, which is similar to the Halo light strip on Vivo iQOO. You can switch to the Game Mode by turning on the SHARK button which is set beside the power button on the phone’s right side, and the volume key is on the left side. The SIM card slot and the Type-C charging port is placed at the bottom. The Black Shark 2 lacks the 3.5mm earphone jack, but there is a Type-C-Audio adapter in the boxing which can solve this problem. Bonus entries: Share your referral link with friends to get an additional 500 entries for each person who enters through the link. All winners will be displayed in giveaway widget within 72 hours of the giveaway ending, and also contacted via email and on Twitter.